Although FC Barcelona's 4-0 victory over Manchester City on Wednesday night at Camp Nou was an impressive achievement, the game did leave behind a pair casualties in the form of injuries to defenders Jordi Alba and Gerard Piqué. Both players were examined by team doctors after the match and were then re-evaluated on Thursday morning. Alba was replaced by LucasDigne early in the first half after pulling up lame with what has been diagnosed as a strained left hamstring. Alba is expected to be out around two weeks. 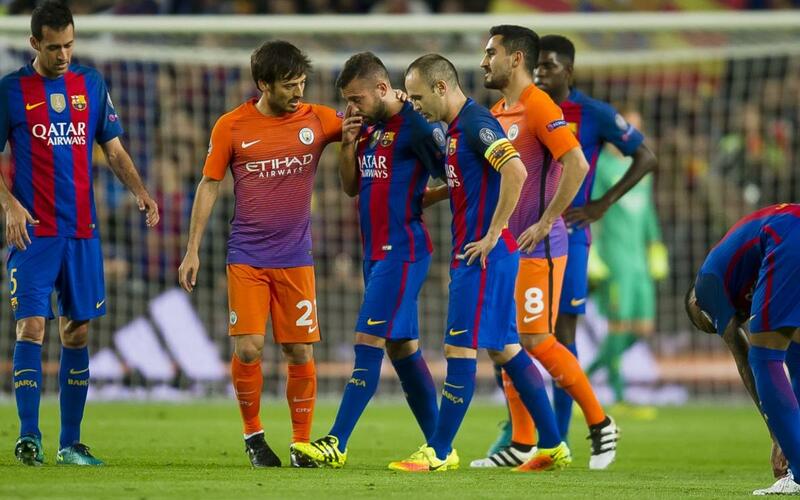 Piqué was injured later in the first half after a tackle from DavidSilva and, after attempting to play through the pain, was replaced by JérémyMathieu several minutes later. Piqué has been diagnosed with sprained ligaments in his right ankle and is expected to be out for around three weeks.